We’d love your help. 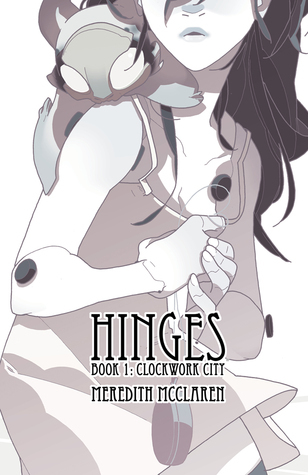 Let us know what’s wrong with this preview of Hinges by Meredith McClaren. To ask other readers questions about Hinges, please sign up. Well… this was a peculiar steam punk story. I try to avoid web comics, because the art style doesn’t always appeal to me but, since this was turned into a graphic novel, I wanted to give it a try. This is the story of a girl named Orio who finds an usual Odd (clockwork pet). She wants to become a mender and repair animals, I assume, but the position isn’t granted to her. In truth, the story is, like I said… strange. There are so many unanswered questions and I could see that the Well… this was a peculiar steam punk story. This is the story of a girl named Orio who finds an usual Odd (clockwork pet). She wants to become a mender and repair animals, I assume, but the position isn’t granted to her. In truth, the story is, like I said… strange. There are so many unanswered questions and I could see that the world-building has potential, except it wasn’t much exploited. For the majority of the galley, I did understand what was going on, but the hostility of the pet, Bauble, wasn’t justified. At all. Still, it was lovely enough and, while I didn’t understand everything and found myself taking time to get used to the art, I appreciated the characters and the originality of it all. Plus, the Clockwork City really is interesting… but there needs to be more of it for us to see. Also, the story needs a male character, because there weren’t any and I think it could make the storyline even more interesting. And maybe add a bit of romance. That would be wonderful. I think Hinges is worth giving a shot, if you’re into web comics or enjoy graphic novels in general, illustrated steam punk stories. What an odd graphic novel, I really wanted to like it and I was in the beginning intrigued about the story then just the story became a bit confusing. Orio is suppose to find herself an occupation, but Bauble ruins it for her all the time and then something else shows up in the Clockword city. I actually found the ending a bit confusing so I reread it on the computer after reading the graphic novel on the iPad and the story did make much more sense on the computer. But I still feel that this story is really odd. But the art was really good and I would like to read more about Orio and Bauble. I received this copy from the publisher through Netgalley in return for an honest review! I really enjoyed Hinges!! The artwork was simple yet absolutely beautiful! Very similar neutral tones are used all throughout Hinges that I felt just worked perfectly with the plot and lack of dialogue. Some might complain that there wasn't enough actual dialogue but I feel like that added to the overall story. Orio is so shy and timid and overwhelmed by her surroundings and the world she's been thrown into. Now, Bauble...opposites attract, right? I feel like because Bauble is so different from Orio, they'll develop a strong bond, or at least I hope they will! *Cue music* I knew you were trouble when you walked in... Troubling companion indeed! I'm still trying to figure out what Bauble is! I don't want to think the worst of him...it is a him right? Anyways, but I have a feeling he's up to no good. I mean look at that face! Dear Meredith McClaren, when can we expect book2?! I just can't wait to get my hands on it!! I hope as readers we get to learn more about the necklace, I'm also really curious to know what Bauble is up to. I can't even imagine what's next in store for Orion and Bauble in Cobble City :). This webcomic turned graphic novel is strange, veeeery strange. 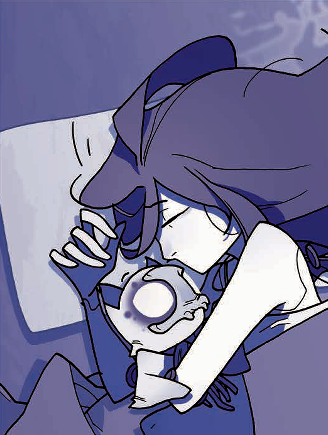 It focuses on a doll named Orio and her Odd, Bauble. Unusually, there is hardly any dialogue so you really have to focus on the illustrations in order to glean what is actually happening in the story. I have to admit that, at times, I was utterly confused. The scenes don't all link together and seem to miss out bits in-between which didn't help. We don't really find out what an Odd is, or what it's purpose is in the story. I found Bauble to be simultaneously cute whilst being a little wayward bugger! Clockwork City depicts Orio and Bauble arriving in a city named Cobble. With the help of Alluet, they go in search of a job for Orio, although this proves extremely difficult when the roguish imp, Bauble, scuppers all of her plans. The ending left me pretty confused but I shall persevere with the second volume since the artwork was absolutely beautiful. Delightful and well thought out. A little light on dialogue and plot, but I feel it has the potential to build itself into something rather unique and beautiful. Also the pacing of the overall arc didn't feel rushed in the least, something that I think will make this patchworks comic a great ongoing series. I feel as if there is a lot more to discover about the clockwork city. Hinges entführt einen mit klaren Zeichnungen und kräftigen Farben in eine atmosphärische Welt, die unserer ähnelt. Orio erwacht eines Tages als neue Bürgerin und darf sich unter anderem einen Kauz aussuchen. Eine Art Begleiter für die Bewohner der Stadt. Orio sucht sich den quirligen Bauble aus und schultert sich dadurch einiges an Problemen auf. Der Kauz, der von Anfang an eine Persönlichkeit hat, die sich normalerweise erst im Laufe der Zeit mit dem Charakter seines Partners entwickelt, zeigt d Hinges entführt einen mit klaren Zeichnungen und kräftigen Farben in eine atmosphärische Welt, die unserer ähnelt. Orio erwacht eines Tages als neue Bürgerin und darf sich unter anderem einen Kauz aussuchen. Eine Art Begleiter für die Bewohner der Stadt. Orio sucht sich den quirligen Bauble aus und schultert sich dadurch einiges an Problemen auf. Der Kauz, der von Anfang an eine Persönlichkeit hat, die sich normalerweise erst im Laufe der Zeit mit dem Charakter seines Partners entwickelt, zeigt durch seine Taten, was alles nicht geht. So führt er Orio und den Leser in die Welt ein und nach und nach bekommt man ein Bild dieser Stadt und um die beiden entwickelt sich eine Geschichte von Freundschaft und Nähe, Zuneigung und Zusammenhalt. Fast die ganze Geschichte über sagt Orio kein Wort, was es zum Schluss noch eindrucksvoller macht, wenn sie es doch tut. if you pointed a gun to my head and told me to explain this comic i would literally just die. and i really can't explain why i loved this so much, either. all i can say it's that it's just so freaking beautiful. most panels don't have dialogue or narration in them, just breathtaking, gorgeous art that explores this fictional world perfectly. mcclaren's style is so defined and convincing. she does such a wonderful job conveying emotion in the expressions of the characters... and it's so weird and if you pointed a gun to my head and told me to explain this comic i would literally just die. My thoughts on this first volume could be summarised as such: very interesting premise, rather peculiar art style, kind of confusing story at times, very beautiful and mysterious atmosphere. Looking forward to see where the story goes in the second one. What an interesting, beautiful, and bizarre story. It's so minimal, and yet, the world feels so vast, HINGES: CLOCKWORK CITY may end up being the most peculiar book I read this year. The main character is a doll who rarely speaks named Orio and her mischievous companion Bauble. Although Orio doesn't talk, her fears, nervousness, and intrigue is very palpable throughout the pages, and I really appreciated that. I loved the artwork and how subdued it felt. It was almost peaceful even when there wa What an interesting, beautiful, and bizarre story. It's so minimal, and yet, the world feels so vast, HINGES: CLOCKWORK CITY may end up being the most peculiar book I read this year. I loved the artwork and how subdued it felt. It was almost peaceful even when there was chaos on the pages. Okay let's cut right to the chase. It was kinda interesting, but a lot of times it was quite hard to follow. There were a lot of close ups that I had to look long and hard at before I understood what the heck was being depicted. Even just in general, whenever a character was doing something it was quite difficult to follow. After a few panels I would be able to get the gist of what characters were doing, but I couldn't get an actual picture of it. Which is bad considering this is a graphic medium. Another thing about the art: It looked very juvenile to me. It's the type of art style that you would expect a teenager to have, not one you would find in print. The type of style that you'd find in a web comic, perhaps. These are the thoughts that were going through my head as I was reading, so when I looked on Goodreads and saw that this actually WAS from a webcomic, I wasn't surprised. Buuuutttttttttt. I am not saying I didn't like the art. It was nice, all things said. I found myself really liking how McClaren draws hands, and the backgrounds were nice too. Okay okay okay art specs aside, HOW WAS THE STORY!?!? Well I guess it was alright. I mean, like I said earlier, half the time I didn't know what the heck was going on. But there was something charming going on, something that makes me want to read more. I have no idea what or why that is. I wouldn't recommend this to someone who's never read a comic or graphic novel before, but if you find the synopsis interesting I say go ahead. Please give this review a "Like" if you've made it this far, and follow me if you want more! Hinges is a webcomic that, thanks to a Kickstarter, is now collected here. There is an manga feel to McClaren's art--the obvious being the large eyes and slim bodies, but also in the stark black and white and the shades of gray, and in the silence of many of the panels. This is what drew me to the book. I am fond of graphic novels that do not rely on words so much to tell their story, and I like artists who can be powerfully expressive through monotones. McClaren's art is "cute," but you can't g Hinges is a webcomic that, thanks to a Kickstarter, is now collected here. There is an manga feel to McClaren's art--the obvious being the large eyes and slim bodies, but also in the stark black and white and the shades of gray, and in the silence of many of the panels. This is what drew me to the book. I am fond of graphic novels that do not rely on words so much to tell their story, and I like artists who can be powerfully expressive through monotones. McClaren's art is "cute," but you can't get away from the subtle, spine-tingly creepiness of her clockwork world. Not a lot seemingly goes on within the pages of this first book, but McClaren's web is enticing, luring me in with the mystery of the town of Cobble and Orio's impish partner, Bauble. The story begins with Orio's arrival in Cobble, where she is introduced to their strict rules. This is a clockwork town, after all, so everything must run like, well, clockwork. But when Bauble chooses Orio, and when Orio is later unable to find her place within society, you know that things are not going to go as smoothly as Margo, the town's organizer, expects them to. But where will things go? That is the question that I am left with and I definitely want to find out the answer. With thanks to NetGalley for the opportunity to read this book in exchange for an honest review. I liked this graphic novel. The artwork and the story were well in synch. The expressions on Orio's face are simply rendered, yet somehow endearing. The panels are simple, silent, with minimal dialogue. Pretty and very minimal dialoguewise. Not totally sure what's going on, but it's a neat world that's been made. I really enjoyed the artwork, it was simple with a limited color pallet, but I think that is the artistic appeal. The characters were beautifully drawn and I enjoyed their facial expressions. As for the story, it was interesting enough, however, I feel it is more of an introduction. I was left wanting to know what happened next, and depending on the next in the series, my rating could go up. I was hoping for a I received a free copy of this book through NetGalley in exchange for an honest review. I really enjoyed the artwork, it was simple with a limited color pallet, but I think that is the artistic appeal. The characters were beautifully drawn and I enjoyed their facial expressions. As for the story, it was interesting enough, however, I feel it is more of an introduction. I was left wanting to know what happened next, and depending on the next in the series, my rating could go up. I was hoping for a little more information on the situation and the setting, but I think Meredith McClaren is attempting to slowly pull in the reader. Orio and Bauble, the two main characters, are interesting. Orio is quiet, and seems somewhat shy, but that may be because she has found herself in an unfamiliar situation and is just observing for now. Although quiet, she has proven she will take on the unimaginable to protect Bauble, who is a mischievous friend/pet/companion (I haven't quite figured out that situation yet). He has already caused Orio a lot of trouble, but they seem drawn to each other and I'm interested to see how their relationship grows. I'd like to read/see the next volume before recommending this to just anyone, however, if someone requests something in this style, I would not hesitate. Looking forward to seeing more from Meredith McClaren, good job so far! At first I didn't get it because it had so little dialogue and I usually pay more attention to text. But in this case it forces you to read the images and find their meaning yourself, like a puzzle. I liked it a lot. Just couldn't get into this E for everyone book. Are they doll people? No real story, as it's mostly told through pictures. Although Hinges began as a web comic, I was not familiar with the story prior to reading this book. What attracted me to this book was the interesting cover and interesting art style. The decompressed storytelling style has been in vogue for about ten years now. While many different writers (such as Brian Michael Bendis) in the commercial world are responsible for spearheading the idea at the idea at the big publishers, two different trends have lead to readers becoming familiar with the idea: m Although Hinges began as a web comic, I was not familiar with the story prior to reading this book. What attracted me to this book was the interesting cover and interesting art style. The decompressed storytelling style has been in vogue for about ten years now. While many different writers (such as Brian Michael Bendis) in the commercial world are responsible for spearheading the idea at the idea at the big publishers, two different trends have lead to readers becoming familiar with the idea: manga and webcomics. Manga, beginning its tradition much in the same was as cheap pulps in the USA had a need for a great number of pages. Web comics, of course, can have infinite page counts because it’s taking place in an electronic medium. Of course, much of what makes web comics so innovative makes them hard to transition to paper. Often various compromises have to be made. And, of of course, the decompressed story telling means that those discovering the story for the first time on paper may find that at the end of the book, nothing much has happened. Of course, it’s always odd to read a story or comic and say that nothing happened. For if nothing happened, the book would really only be a sentence long. Instead it’s more accurate to say that at the end of Hinges Book 1, we barely know more than we did when we started reading. But quite a lot has actually happened. And we’ve also been exposed to a pretty interesting universe. It’s often said that those in charge are puppet masters. In this world it appears to literally be true. Just a few pages into the book we meet Senior Orderly Margo. She appears to be a marionette-style puppet. What kind of world has a need for puppets in charge? And who is controlling the puppets? Is it some kind of computer or is someone actually behind the actions? Also adding to the idea of self-determination is the fact that, in a flashback, we see Oreo hanging with other marionettes. It is her bauble a weird cat-like being, who knocks into her and drops her onto the floor where Margo finds her. While reading this book, this just filled me with so many questions. What were the extra marionettes for? Why were they not being used? What does it mean that her bauble caused her to be seen as a non-marionette? Is that why she has such a hard time fitting in? Was she made for some other purpose? Speaking of her bauble, through a bunch of flashbacks we learn he stole the Oreo pendant (which is why Margo names our main character Oreo) from a couple and was fleeing when he fell through the roof and dropped her out of the rafters. He spends nearly the entire book causing problems for Oreo and attempting to steal the pendant. Eventually Oreo defends him from some creature and he appears ready to stay with her for a while. I have a feeling Bauble will be the clue to what’s going on in this world. This is one of those works that need to be read twice to be fully comprehended and appreciated. The artwork is beautiful, but as the author builds up the tension in the story, some boards are quite difficult to understand without knowing what you are meant to be seeing, which unfortunately makes this work rat Hinges Book One: Clockwork City was first serialised on the author's blog, Hinges. This publication compiles the first book in the series, where some boards have been revised and improved. Dialogue is very sparse, and the main character, Orio, pretty much does not utter a single word - her facial expressions (masterfully portrayed by the author) are all we need. As Orio prepares to leave the factory (she is a mechanical doll) and is introduced to her new life, she appears very lost and shy, Bauble, an odd (familiar), steps in from the very beginning to help her. The seemingly troublesome character is the real hero of this story, as something dark lurks in the city of Cobble. This is a promising beginning to the series, worth persevering with, and definitely something that will work best in printed format. If you are reading a digital copy, please be aware that pages 40 and 41 are meant to be a double spread (i.e. they need to be viewed next to each other). The second book in the series, "Paper Tigers", is available online in full. The third book, "Mechanical Men", is currently being serialised, with updates on Mondays and Fridays. This book was provided by Diamond Book Distributors on NetGalley in exchange for an honest review. 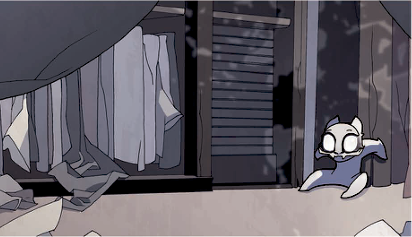 Hinges, a webcomic turned graphic novel, is the story of a doll named Orio and her Odd, a toy companion, called Bauble. As Orio tries to get a job and fit into society in the city of Cobble, which she has just entered, she is unable to fit in - mostly because Bauble keeps causing mayhem. Can this unusual pair This is a trimmed down version of my review, to view the full review visit The Book Ramble. 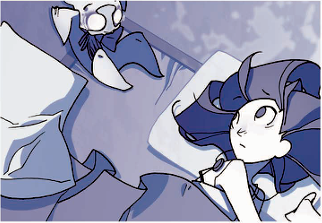 Hinges, a webcomic turned graphic novel, is the story of a doll named Orio and her Odd, a toy companion, called Bauble. As Orio tries to get a job and fit into society in the city of Cobble, which she has just entered, she is unable to fit in - mostly because Bauble keeps causing mayhem. Can this unusual pair ever fit into the city? Or will they destroy the whole town? I found Hinges engaging, beautiful, but a little confusing. The story is a little hard to follow because there isn't much being said, and the art doesn't seem to convey movement as clearly as it should. The art is however really beautiful. I found the concept really interesting and am really interested in seeing more. The story starts with Orio entering the city, and by the end of the book she's only really just begun to establish herself as a citizen, getting a job and a place to live. The world in the story is sort of steampunk-dolls-ish, but I think the world building isn't fully there so the setting and history aren't well established at this point. I found the action interesting but I think it left too many questions and made me kind of confused by the whole situation. I think the best thing about this book is definitely the art. The art is so beautiful unique. It's primarily grey tones and white, but there are flashes of colours - reminds me a little of Quest and Journey for that reason and also the limited dialogue. I love this style so that was a huge plus for me. I think the main downside is that McClaren wasn't able to capture movement quite so clearly so you wind up with a lot of confusing panels and the action becomes really unclear, which was a real letdown. Давно не встречала такой бесполезной плюшки. За 100 страниц повествовательные элементы либо вообще отсутствуют, либо старательно намекают на что-то эфемерно неведомое. Я не против красивых картинок, пока из них не пытаются сделать цельную историю с помощью нескольких стежков. Hinges – как раз такой случай. Арт можно разглядывать долго, и вовсе не благодаря его intricacy, как можно подумать вначале, а исключительно из-за невнятных переходов. Зачастую невозможно понять, где кончается один персонаж Давно не встречала такой бесполезной плюшки. За 100 страниц повествовательные элементы либо вообще отсутствуют, либо старательно намекают на что-то эфемерно неведомое. Я не против красивых картинок, пока из них не пытаются сделать цельную историю с помощью нескольких стежков. Hinges – как раз такой случай. Арт можно разглядывать долго, и вовсе не благодаря его intricacy, как можно подумать вначале, а исключительно из-за невнятных переходов. Зачастую невозможно понять, где кончается один персонаж и начинается другой, и что вообще происходит в кадре (особенно это касается динамических сцен). Парой стрипов подобного толка я еще могу насладиться, но когда это превращается в целую книгу продираний сквозь одногаммовые, слившиеся воедино сценки – хочется закинуть эту симпатичную, но утомляющую муть подальше на антресоли. Девочка попадает в новое окружение, находит друзей, попадает в переделки-приключения, попутно ступая на путь осознания своей судьбы. Это если суммировать все произошедшее и придать оному хоть какую-то форму общими фразами. На самом деле недосказанность во многих эпизодах заставляет мозги закручиваться в трубочку в попытках придумать объяснение происходящему. Например, почему ее дружок постоянно творит какую-то хренотень и убегает драться с чудовищами – отражает ли это ее скрытую бунтарскую натуру, подчеркивает неверность попыток заключить ее в рамки списка, или он просто маленькое исчадие ада и ему доставляет удовольствие всячески ее мучать? Или он призван тонко намекнуть на то, что у каждого своя судьба? К концу книги я даже начала склоняться к тому, что он может быть комплиментарным воплощением ее души. Как же грустно иметь постоянно работающие на всю катушку мозги. У меня в процессе этого получасового чтения столько мыслей циркулировало в голове, и все они абсолютно бесполезны – потому что автор предпочитает полунамеками и недосказанностями убивать всяческую мыслительную деятельность, взамен щедро лаская взор бессмысленными картинками хрупкой девочки и ее вертлявого спутника. Незачет. 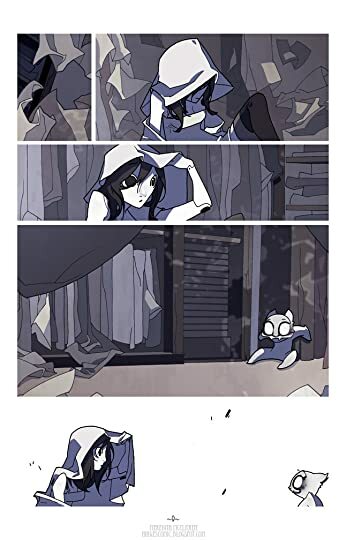 Hinges is a very interesting and different comic - a little like manga actually. The main character is a doll named Orio, who gets to choose a toy companion to aid her. She ends up with Bauble and all the toys are very much alive. Bauble just isn't your typical companion and Orio gets in trouble of course and overall the city that works like a clockwork is very strange too. This first volume basically introduces us Orio and how she and Bauble try to work together in a sense. I really like how mo Hinges is a very interesting and different comic - a little like manga actually. The main character is a doll named Orio, who gets to choose a toy companion to aid her. She ends up with Bauble and all the toys are very much alive. Bauble just isn't your typical companion and Orio gets in trouble of course and overall the city that works like a clockwork is very strange too. This first volume basically introduces us Orio and how she and Bauble try to work together in a sense. I really like how most of the comic is without words and moving with pictures alone. There's this eerie feeling to the story and the world especially. The structure works OK and McClaren is quite creative with her panels. The transitions between panels are sometimes out of place and the storyline feels somewhat scattered from time to time. This is quite common when you don't use words to move the story - the panel flow needs to be seamless and it hardly ever is. Gentilmente oferecido pela Image Comics, tive a oportunidade de ler a graphic novel de Meredith Mcclaren. Hinger era inicialmente uma webcomic e posteriormente é que foi publicada como graphic novel. Tendo como espaço um lugar completamente inventado meio steampunk e fantástico, conta a história de Orio e o seu amigo Bauble que são recém chegados/despertados neste mundo. Todos que despertam ou chegam a este mundo tem de arranjar uma função e Orio depois de varias tentativas fica numa loja a concer Gentilmente oferecido pela Image Comics, tive a oportunidade de ler a graphic novel de Meredith Mcclaren. Todos que despertam ou chegam a este mundo tem de arranjar uma função e Orio depois de varias tentativas fica numa loja a concertar animais (pelo que foi dado a entender), porque a história em si não descreve muito bem esta parte. Orio não fala muito, por isso o que nos dá a entender é mais por meio faciais e não por pensamentos ou falas, tudo está estampado na cara dela e isso agradou-me muito. Eu em geral gostei de toda a arte envolvida, é limpa e simples, no entanto a capa deixa muito a desejar a nível de enquadramento, sinceramente haveria muito por onde explorar. Orio, a living marionette, is born in a city called Cobble. Cobble has a well-organized process for assimilating new citizens, providing them with clothing and job-hunting assistance… as well as an “odd,” which is something like a pet, but which goes with you everywhere. Orio ends up with a feisty cat-type thing named Bauble. Bauble seems bent on sabotaging Orio’s chances of fitting in, and possibly even surviving. With her odd sabotaging job after job, Orio’s at risk of alienating everyone in to Orio, a living marionette, is born in a city called Cobble. Cobble has a well-organized process for assimilating new citizens, providing them with clothing and job-hunting assistance… as well as an “odd,” which is something like a pet, but which goes with you everywhere. Orio ends up with a feisty cat-type thing named Bauble. Bauble seems bent on sabotaging Orio’s chances of fitting in, and possibly even surviving. With her odd sabotaging job after job, Orio’s at risk of alienating everyone in town. What will happen to her, especially when the bureaucracy refuses her the job she seems best suited for? I loved this graphic novel so much! It was so interesting and fun. The artwork was beautiful. I really liked Orio but Bauble was so awesome! He was so cute and funny. Hinges reminds me of Lilo and Stitch in a way. The concept is so cool and different. I like that Orio is a doll. It’s just so awesome and interesting. This isn’t a very large graphic novel, only 112 pages, and it does feel a little too short. There isn’t a lot of dialogue so it’s a really quick read. I wish I could have spent an hour I loved this graphic novel so much! It was so interesting and fun. The artwork was beautiful. I really liked Orio but Bauble was so awesome! He was so cute and funny. Hinges reminds me of Lilo and Stitch in a way. This isn’t a very large graphic novel, only 112 pages, and it does feel a little too short. There isn’t a lot of dialogue so it’s a really quick read. I wish I could have spent an hour reading this instead of 15 minutes. And I wish I had #2 right away! But that’s just a little thing. This is technically a reread of chapters 1 through 4 for me. There are a lot of things that I'm catching this time around that I missed entirely in the original web version. I'm not sure if that's because this is a second read or because it's a physical copy. Hinges as beautiful artwork and a muted color scheme that matches the slow-paced, largely understated narrative style. Expressions and emotions are McClaren's specialty, and that really shines in this first volume. It's a very quick read, as l This is technically a reread of chapters 1 through 4 for me. It's a very quick read, as large portions are just images without any dialogue, and that works wonderfully here. I'm still left with more questions than answers, but that's okay because I found answers that I didn't realize were there to questions that I didn't realize I had. I read this as a webcomic. And damn, it's good. The dialogue is very sparse, but when it's there, it's great, laying out information in an interesting manner and highlighting the personalities of the characters. The story is very strange, and the reader learns about the world as Orio does. McClaren doesn't trust the readers' hands, trusting in our intelligence and our ability to follow along. But the real draw is the art. The art is gorgeous. Absolutely stunning. Just some amazing stuff. Pretty, I read this as a webcomic. And damn, it's good. The dialogue is very sparse, but when it's there, it's great, laying out information in an interesting manner and highlighting the personalities of the characters. The story is very strange, and the reader learns about the world as Orio does. McClaren doesn't trust the readers' hands, trusting in our intelligence and our ability to follow along. But the real draw is the art. The art is gorgeous. Absolutely stunning. Just some amazing stuff. Pretty, and expressive, and with a good sense of motion. It catapulted her into my top 10 favourite comic artists, and I read a lot of comics. Meredith McClaren is an illustrator and cartoonist who has no business doing either. She sometimes entertains the idea of drawing the fourth book in Jen Van Meter’s Hopeless Savages series. And her journal comic Scraps indulges her closeted narcissism. Supposedly she has a postal code in Arizona, but really, she could be anywhere. And don’t touch her stuff.